I have an aversion to working with solid colored fabrics. They always seem so boring sitting there next to the gorgeous prints. I can get behind a solid color that is textured, but in my experience, those are very difficult to come by. But a solid colored separate can certainly come in handy. And in reality, this linen/rayon blend has more texture than most solids. 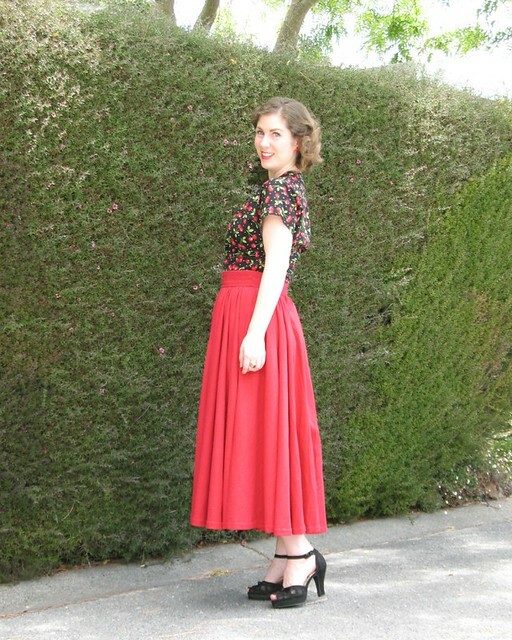 So I decided it was time to get over myself and add a plain red skirt to my wardrobe. 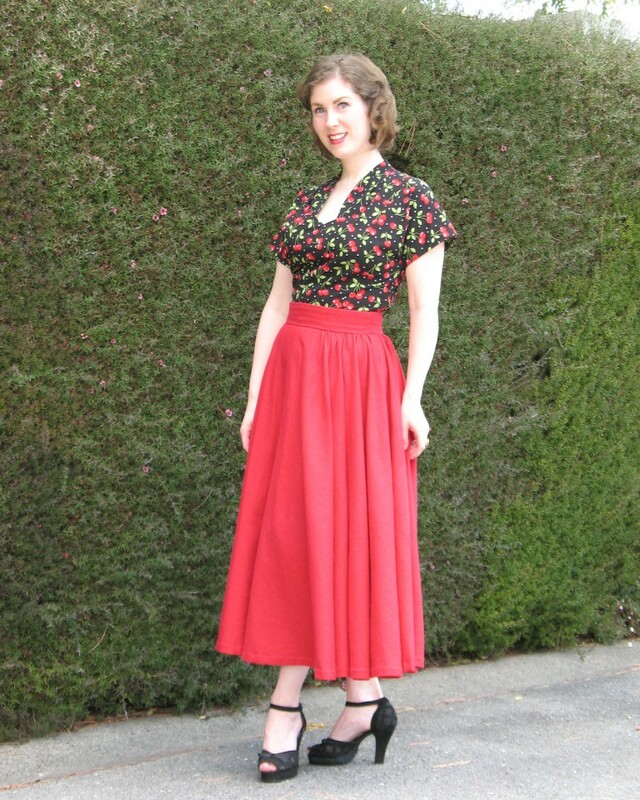 I used one of my favorite skirt patterns (Butterick 4792, which is actually a dress). I added six inches to the hem this time around. This pattern is certainly a fabric hog (especially with the added length). If there was any question, just look at the width of that hem! I added a shaped waistband with a few pieces of boning to help keep its shape. Unfortunately, the waistband ended up too loose - the weight of more than four yards of linen fabric is heavy! Which means I am going to have to do a little surgery. And the only thing I really hate about the sewing process is re-working a finished garment. Ggrrrr. But in this case, I am hoping it will be worth the extra effort. Shoes: Miss L Fire "Bel-Aire"
I've never thought about using boning in a waistband. How does the weight of the skirt feel? I actually like when my garments have a weighty feel to them. I love weighty clothing as well! And this one has quite a bit of heft to it. The problem is all that weight in the skirt keeps pulling the loose waistband down (I felt like one of those guys who sags their pants and has to keep pulling them up during the day - not a good thing!!). Just love how your skirt hangs. I've never tried boning in the waistband great idea. 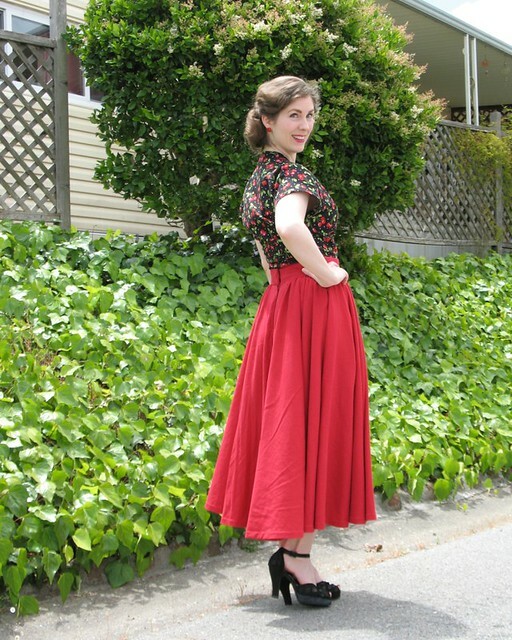 Your photos and sewing are so gorgeous! I like to dress quite conservatively (legs covered) so in summer I am not as sure of what to wear and to keep cool. This looks elegant and also suitable for all occasions. Cute skirt and with boning in the waistband, never would of thought of that. This whole outfit is absolutely gorgeous! You look perfect in it. I love that it's dressy yet super fun! This is gorgeous! I'm trying to make myself sew with more solid colours lately too - I find that I wear them a lot more than patterns! Now, about that boning...is it small vertical "riblettes", or long horizontal pieces mean to snug the side curves atop the high hip?? The boning pieces are small, inserted vertically (mostly to help a wider waistband from collapsing during wear - they don't do much shaping in this case). 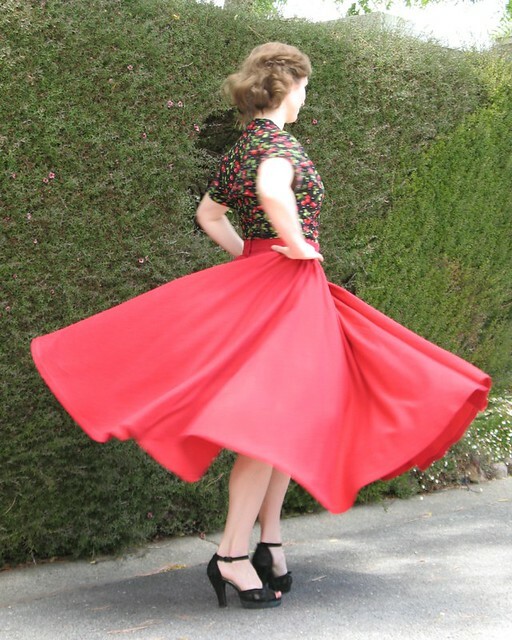 It's a lovely skirt but to be honest, I really can't understand an aversion to solid coloured fabrics ;) I love those! When I look at your wardrobe, it makes me want to sew up a whole bunch of solid colored garments . . . but then I get to the fabric store and I am seduced by the prints! I love the prints myself, but now and then I like to match a little. I am not sure if I enjoy alterations because of the end results, or just the surgical process of them. Possibly both. And yes, we all wanna see the boning! 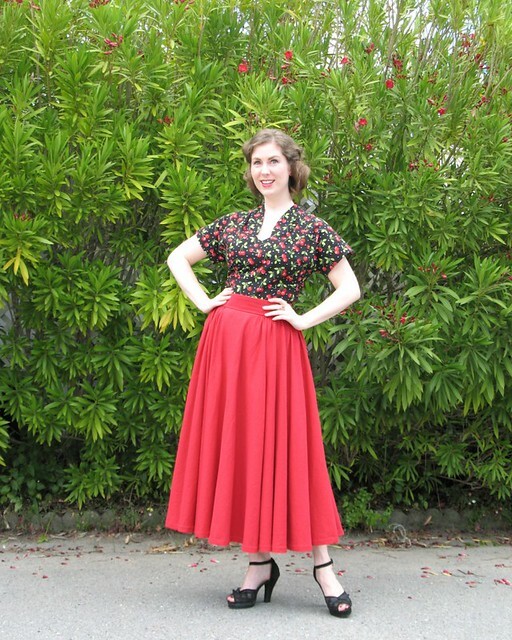 I'm not too keen on sewing with solids either, but a bold Red skirt...now that I can handle. :o) It is fantastic! 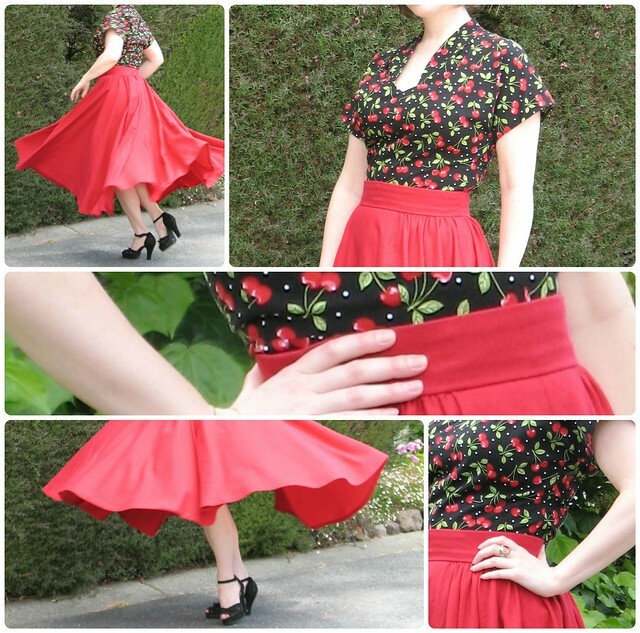 This such an elegant, classy, delightfully fun way to marry both solids and patterns together and to sport cherries in a way that looks nothing short of downright sophisticated. Your whole outfit is perfect:) I really admire sewers who can make basics look so elegant and well done. Your skirt is beautiful and the color is gorgeous. Sewing Friends are the Greatest!